When you offer your child juice his taste buds are enjoying an intensely sweet flavor, if you mix that with the other foods he eats, like those Go-Gurt yogurts and snacks, there is a good chance your child is eating a lot of sweetened foods. His or her taste buds are quickly learning to start at this level of sweetness, and when things aren’t sweet, they can begin to reject the food and flavor. Each day a child further develops his taste preferences that can last a life-time. Juice is considered empty calories. Even though it has some nutrients from the fruit, its high concentrate of sugar counteracts the benefits of the nutrients. Everything in moderation, including moderation. Your child is going to go to the occasional party where Capri Suns are offered and it’s fine if a child occasionally has a juice! Sugar becomes toxic to the body when a child or adult has too much of it. Keep reading to find out how much is too much. How Much Sugar Should Kids Have in a Day? 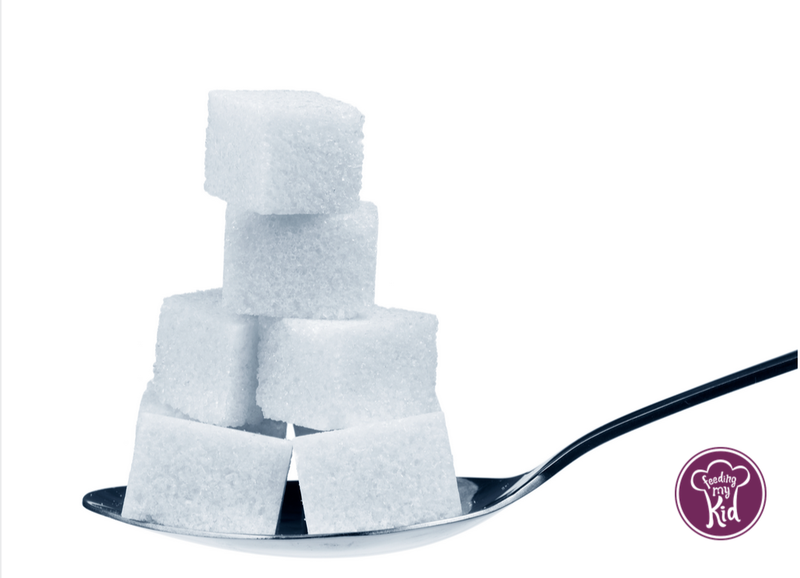 Children under 8 years old should have less than 4 teaspoons of added sugar in a day. That’s everything combined! It’s so easy to eat more than the recommended amount of sugar! the average 4- to 8-year-old takes in 21 teaspoons a day! This is too much sugar! Drinks are the number 1 contributor to America’s Obesity and chronic health issues. A far healthier option is to eat the whole fruit versus drinking the juice. Many 2-5 year olds who drink 100% juice consume more than 10 oz a day. Orange juice generally has 22-24 grams of sugar (or 6-7 teaspoons) per 8 oz no matter if it’s organic, conventional, freshly squeezed or from concentrate. 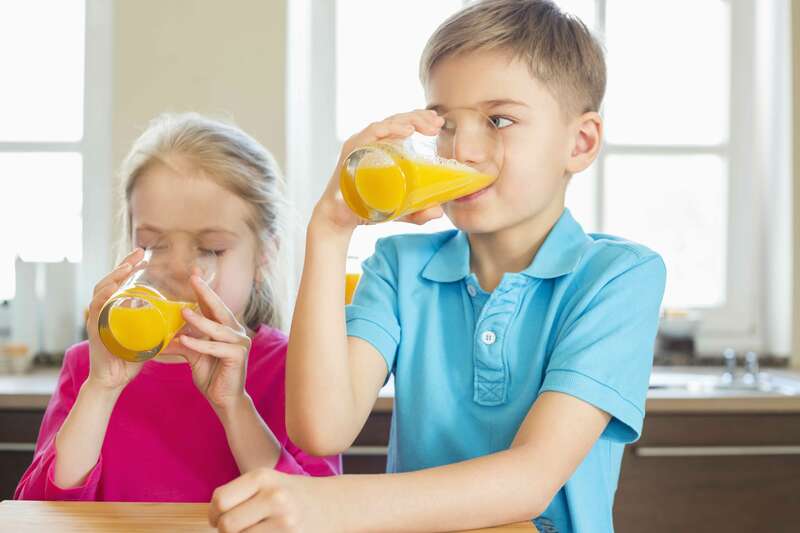 This means your child is drinking 7 teaspoons of sugar from one orange juice or apple juice. What if they have a few juices a day? What if your child had some ketchup, cereal, yogurt and tomato sauce? That can add up to a lot of sugar in a day. Children Under 8 years Old Should Have Less than 4 Teaspoons of Added Sugar in a Day. That’s everything combined! It’s so easy to eat more than the recommended amount of sugar! According to the American Heart Association 4- to 8-year-old Take in 21 Teaspoons a Day! Juice is more filling than water, so kids can fill up on juice and potentially not eat a nutritious meal at mealtime. So your child will come off as pickier because he or she is not hungry before a meal. 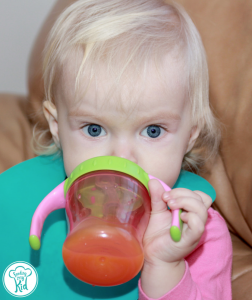 According to the book, Give Peas a Chance, toddlers should not be drinking more than 32 hours of fluid a day, and, no more than 4 oz of 100% juice a day. If your young child is drinking more than this, your child might be displacing milk (regardless of what milk you choose). Milk has protein, healthy fats (that growing brains need to develop properly), and other valuable benefits. Kids quickly get used to tastes, especially when they are sweet. Start to dilute the juice by watering it down. Over time, continue diluting the juice until you can transition them back to water. Do the same thing with chocolate milk and any other sweet fluids they are drinking. 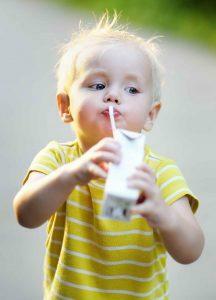 Young children who drink juice often transition to soda drinks, as they get older. Also, do your best to keep kids away from juices, sodas, and sports drinks. Apple juice, unsweetened has 24 g of sugar per cup or 6 teaspoons of sugar. Juice isn’t as good as eating the actual fruit. When manufacturers extract the juice from the fruit, they have to process it and store it before it can be bottled. This process strips out the fiber from the fruit and leaves it very high in sugar. If a child eats the actual fruit then the fiber in the fruit will delay the absorption of sugar.. think of it as a steady stream of sugar getting absorbed. Since juice strips out the fiber, the sugar is absorbed all at once, more like a flash flood. This might surprise you, but a 12 oz can of Coca Cola and a 12 oz glass of Apple Juice have virtually the same amount of sugar. 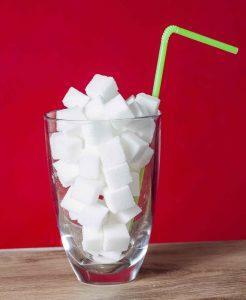 Would you ever give your child almost 10 teaspoons of sugar? Kids quickly get used to sweet foods and are less likely to want to eat vegetables because they have more of a savory taste. It will be hard transition, but it’s worth it in the long-term. 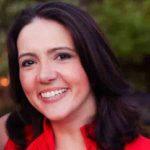 Childhood obesity is a huge problem and a growing problem. It often starts with the small choices we make daily with our kids, like on-demand snacking, offering poor nutritional food options like mac and cheese and chicken nuggets and giving kids juice. This is important: Researchers found that when you pair a juice with a vegetable, kids from ages 2 – 5 would eat a lot less of the vegetable compared when researchers paired the vegetable with water. When kids start to crave sugar, fat and salt this is called pervasive palate preferences. They get accustomed to these flavors and really start to crave them. Think about what happens when a child drinks a sweet juice, it will bring out the bitter flavors of the vegetable even more, and generally is enough to turn a kid off from eating it. You have to get kids out of this sweet cycle. If a child is drinking sweetened beverages often, then his sense of taste starts to change and in order to eat food, the child would need the food to have a certain level of sweetness in order to want to eat it. That’s why it’s so important to make changes now. As children get older he or she will mostly likely trade their apple juice for soda; and the vicious cycle only gets more ingrained. Plus, find out why the sugar in juice is so damaging for children and adults, even if the juice says no sugar added. Homemade smoothies are different than juice since the pulp stays in the smoothie. However, if you are adding a lot of fruit into a smoothie, think about how much sugar your child is eating in the smoothie. 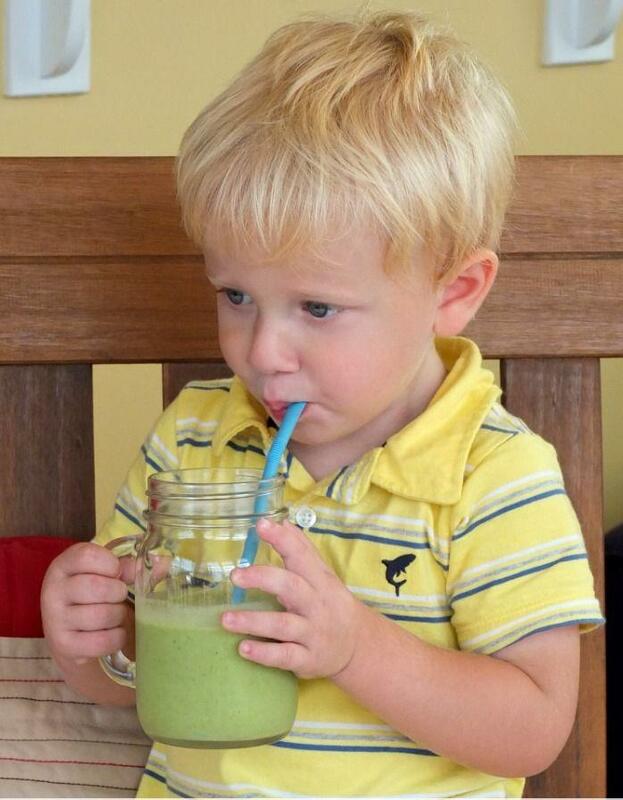 Would your child be able to eat a banana, four strawberries and some spinach in one smoothie? Why is that important? All of that sugar, even from fruits, is hitting the body at one time, spiking your child’s insulin levels to help manage all that sugar in one sitting. The goal is to give your child small amount of whole fruits throughout the day. If not, you may want to consider how much fruit you are adding to your smoothie and see if you can start reducing how much fruit you add to the smoothies. Vegetables are high in fiber so they are perfect for smoothies. Kids quickly get used to tastes, especially when they are sweet. 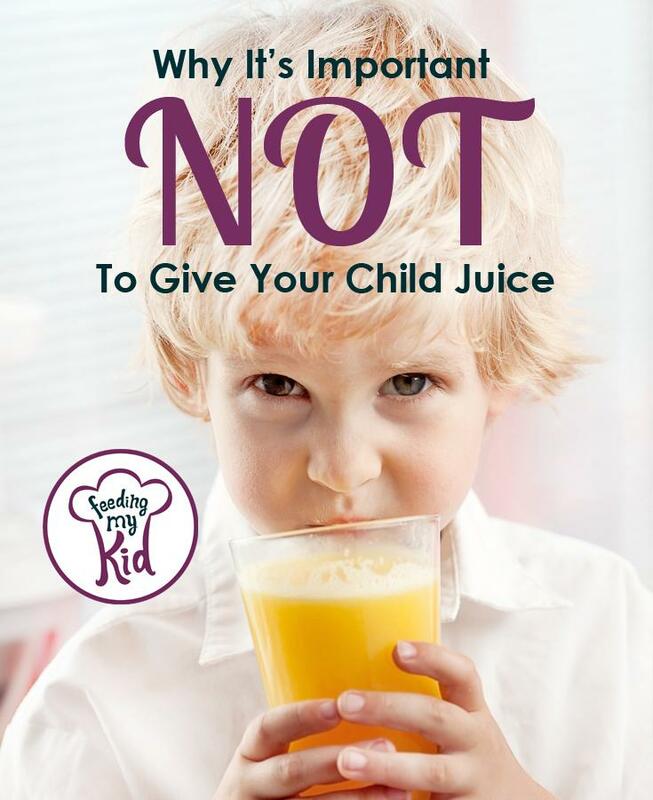 Learn why juice for kids isn't as healthy as you think and what you can give them instead.